For the first time an international research group has revealed the core mechanism that limits the indium (In) content in indium gallium nitride ((In, Ga)N) thin films – the key material for blue light emitting diodes (LED). Increasing the In content in InGaN quantum wells is the common approach to shift the emission of III-Nitride based LEDs towards the green and, in particular, red part of the optical spectrum, necessary for the modern RGB devices. The new findings answer the long-standing research question: why does this classical approach fail, when we try to obtain efficient InGaN-based green and red LEDs? In their work the scientists tried to push the indium content to the limit by growing single atomic layers of InN on GaN. However, independent on growth conditions, indium concentrations have never exceeded 25% - 30% – a clear sign of a fundamentally limiting mechanism. 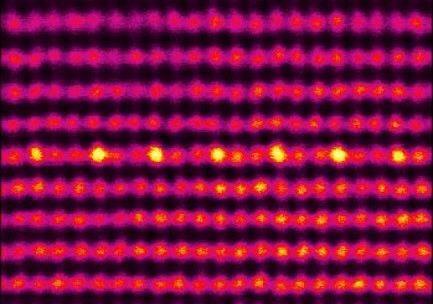 The researchers used advanced characterization methods, such as atomic resolution transmission electron microscope (TEM) and in-situ reflection high-energy electron diffraction (RHEED), and discovered that, as soon as the indium content reaches around 25 %, the atoms within the (In, Ga)N monolayer arrange in a regular pattern – single atomic column of In alternates with two atomic columns of Ga atoms. 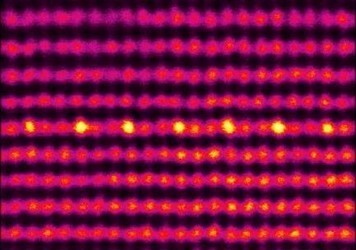 Comprehensive theoretical calculations revealed that the atomic ordering is induced by a particular surface reconstruction: indium atoms are bonded with four neighboring atoms, instead of expected three. This creates stronger bonds between indium and nitrogen atoms, which, on one hand, allows to use higher temperatures during the growth and provides material with better quality. On the other hand, the ordering sets the limit of the In content of 25%, which cannot be overcome under realistic growth conditions. The work is a result of a collaboration between Leibniz-Institut für Kristallzüchtung (Berlin, Germany), Max-Planck-Institut für Eisenforschung (Düsseldorf, Germany), Paul-Drude Institut für Festkörperelektronik (Berlin, Germany), Institute of High-Pressure Physics (Warsaw, Poland), and State Key Laboratory of Artificial Microstructure and Mesoscopic Physics (Beijing, China). SOURCE: Forschungsverbund Berlin e. V.